Last Saturday, white nationalist demonstrators clashed with counterprotesters at the entrance to Lee Park in Charlottesville, Virginia. When you step on the stage Tuesday evening at the Phoenix Convention Center, you will most likely be met with the cheers of your faithful. You never look as satisfied as when you are on stage, drinking in the adoration you seem to need as fuel. But what is happening outside those walls, beyond the reach of the stage, is what you should know about Arizona. We are a diverse community. Many of us are from somewhere else, but for others our roots here go back generations — before Arizona was a state, before Arizona was a U.S. territory, before the Gadsden purchase, when this land was Mexico, and long before that, when the original Americans farmed the desert. Mr. President, we’ve heard your kind of pandering before. We know how it works. We’ve been through SB 1070, when the Arizona Legislature passed laws that sought to turn local law enforcement into federal immigration police targeting Latinos and other people of color. Many Arizonans cried foul, rightly so. The courts dismantled the law piece by piece, and its architect and champion in the Legislature was defeated in a recall election. In that fight, supporters decried the characterization of the measures as being biased or racist. Maybe they truly couldn’t see it. But the target of the legislation was clear: No one was calling for white people suspected of being undocumented Canadians to “go home.” Only people with brown skin were automatically suspected as being non-American. Arizona is still dealing with the damage and divisions that fight cemented. 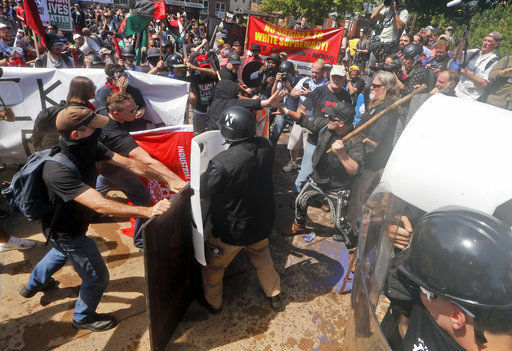 We see it happening again, on a deeper and national scale, after the “Unite the Right” rally of white-power and right-wing groups in Charlottesville, Virginia. The poison, rage and fear the neo-Nazis, fascists and racists are trying to infect our country with cannot go uncountered. A woman, Heather Heyer, was killed speaking out against these forces by a pro-Nazi man who drove his car into a crowd and then fled. So, Mr. President, while you may think that people speaking out for equality, justice, diversity and inclusion are the same as neo-Nazis, white nationalists, white supremacists and your garden-variety unorganized racists, we are here as Arizonans to tell you, no, you are wrong. Very, very wrong. We recognize that Arizona went for you in the November election. Some of those people will be with you no matter what you do or say. But others, and we hear from them, are disappointed in you. So disappointed. They thought they were voting for a businessman who would lead. Instead, we’ve got a man who doesn’t understand why neo-Nazis and racists must be denounced strongly and immediately. You were wrong to send a message to the worst parts of our society that their beliefs are acceptable. We don’t want you to come here and justify your changing statements, your divisive beliefs. So please, Mr. President, spare Arizonans the spectacle. Stay home.